A shoulder joint is a ball and socket joint where head of the upper arm bone (humerus) articulates with the glenoid socket of the shoulder. 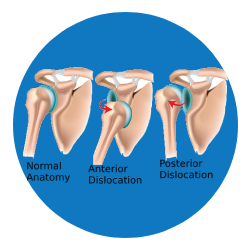 Dislocation of shoulder occurs when the humerus is out of the glenoid socket. This dislocation can be partial or complete.